[GRANDPA VOICE] When I was your age, using your phone at the table was impolite! – me in 40 years. Next time you’re dining out, look for a table of 20 or 30-somethings and wait for their waiter to drop off a plate. Quick as a cricket, their phones will fly out and start snapping pic after pic. If you didn’t know any better you’d think a Kardashian just walked in the room. But no, that was just an appetizer. Some more traditional restaurants such as Alice Waters’ famous Chez Panisse in Berkeley, have adopted a strict no-cellphone policy to combat this trend. But smart restaurateurs are embracing it like savvy marketers. These folks now design restaurants with Instagram in mind. They skirt dim lighting in favor of bright overhead spotlights (which make for better pictures), choose menu items based on photogenics, and see everything from plates to plants through the lens of their iPhone X. More importantly, they are seeing results. For millennials, an Instagram photo from a friend is much more influential than a Yelp review. According to research by Zizzi, 30% of 18-35-year-olds actively avoid restaurants with a weak Instagram presence. One restaurant owner we spoke with in San Diego estimated that he gets about 70% of his business from social media. 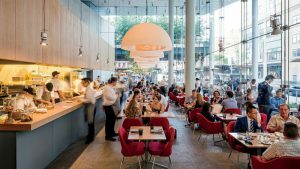 Particularly in cities, trendy restaurants are finding new ways to cater to this new crowd of diners. How do they do it? Here are 11 Ways Restaurants are Being Transformed by Instagram. (Modern Restaurant Design Will Never be the Same) Enjoy you restaurant lovers, marketers, and picture-takers! 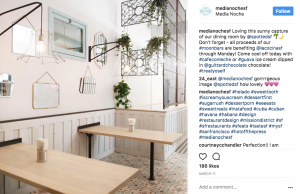 Are you a restaurauteur looking to up your Insta-game? 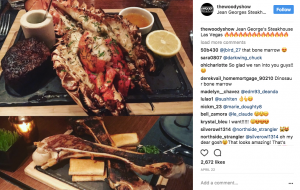 Check out another blog post on the subject: Instagram Marketing for Restaurants: The Jumper Approach. 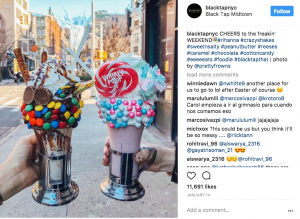 The New York City restaurant Black Tap Craft Burger’s & Beer attributes much of their success to Instagram. Their over-the-top colorful “Crazy Shakes” went viral in NYC, garnering attention from Vogue who called them the “New Cronut.” And they’re not the only ones taking advantage of this trend. 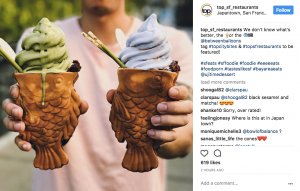 When I was researching this article, I reviewed Instagram’s top food posts, perusing accounts such as @eater and @infatuation, and diving into what’s trending on top foodie hashtags. Everywhere I looked, I saw new derivations of colorful, over-the-top desserts and drinks. New York is the clear trendsetter. 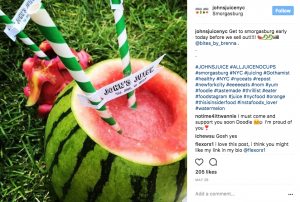 These hollowed out fruit juices from @JohnsJuiceNYC are everywhere on Instagram right now. In this respect, Starbucks is ahead of the curve. 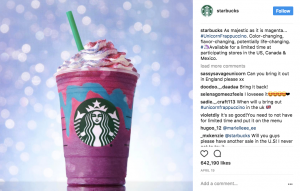 Their “Pink Drink” took over Instagram when it came out, and they’ve since followed up with the more colorful, equally ‘grammable, “Unicorn Frappuccino,” another huge hit. 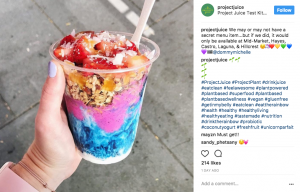 Drinks aren’t the only thing being “unicorned.” Watch out for more “unicorned” items like this parfait from @projectjuice in San Francisco. And it’s not just the food that’s getting a makeover. 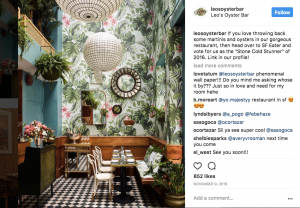 Restaurant interiors are increasingly being designed with Instagram in mind. Two Hands, an Australian restaurant in New York, embodies today’s modern restaurant interior. The design is clean and might even be considered minimalistic if it weren’t for a few colorful accent pieces. In particular, the blue mugs make pictures of their tables really pop. 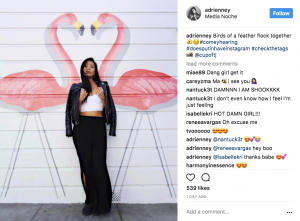 Media Noche’s Instagram Aesthetic is on Point! 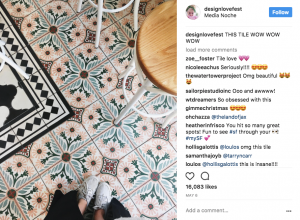 Tiles are another colorful accent making waves on foodie hashtags everywhere. 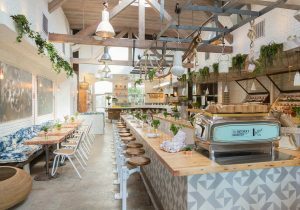 Take recently opened Media Noche in San Francisco’s hip Mission District. This restaurant has no bad angles. Leo’s Oyster Bar is another San Francisco restaurant where patterns abound. You can find tiled floors there too, but the real star of the show is the floral wallpaper. Combined with big overhead lights, and yes, more hanging plants, it’s a like-worthy combination. I can’t tell you how many times I’ve seen this exact same picture of this section of the restaurant pop up on my Instagram feed. Heck, I want to go there just so I can snap a pic myself. “What else can we make photo-worthy?” you can imagine restaurant owners asking themselves once they’re done designing an epic interior. The answer, of course, is the exterior. Restaurants like Media Noche are making their exterior walls a lot more interesting by adding artistic murals painted by local artists. These colorful artworks make for awesome portrait backgrounds. Lesson Learned: If you’ve got a boring white wall outside your space, consider spicing it up with a mural. Signs are big, especially neon. There’s just something about giant words that turns out well on tiny phone feeds. Chambers eat + drink at San Francisco’s trendy Phoenix Hotel, was ahead of this trend when they opened in 2011, but today neon signs are starting to feel a bit overplayed, especially in coastal cities where it’s almost definitely been done before. 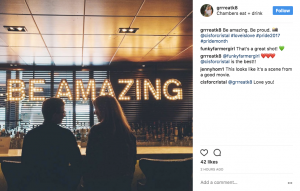 Nevertheless, Chambers’ iconic “Be Amazing” sign behind the bar still gets featured in about 20 new Instagram photos a week. That’s some great free marketing. 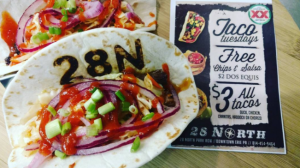 Instead of large signage, hip restaurants are turning to brand their food with words. 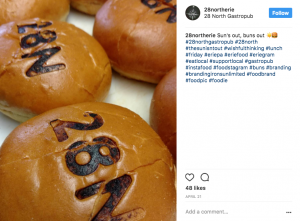 Sometimes this involves a literal brand, like at 28 North Gastropub, where both burgers buns and taco shells are singed with an iron brand in the shape of their “28N” logo. 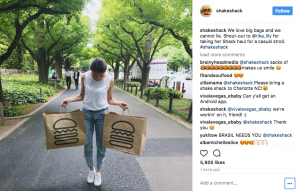 Shake Shack is ahead of the trend on this one, so watch for hip eateries to follow suit. Last but not least are the dominance of overhead spotlights above tables. Their importance cannot be understated. 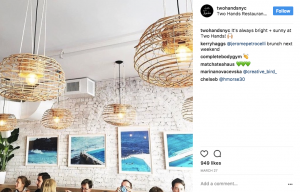 We’ve seen how modern Instagram-first restaurants such as Two Hands and Media Noche favor clean, light interiors with vibrant accent colors, instead of more traditional low lights and candles. This means diners can snap a pic anywhere in the restaurant without having to use flash. Very important. Even more important though is that guests can snap photos of food without the flash. My personal Instagram is basically just a bunch of pictures of food. I take more pictures than anyone I know, and I will tell you that restaurants with good lighting are RARE. For me there’s nothing worse than going out to eat, expecting to get a great Insta out of it, but failing to do so because of bad lighting. Most of the time I ask whoever’s at the table to use their phone’s flashlight to help, but even that can be hit or miss. That’s why I’m so excited when a restaurant like Jean-Georges Steakhouse in Las Vegas has spotlights above every table. Their dining room is dark and traditional, but these spotlights make all the difference and are the reasons why pictures of their food always turn out well. It’s a small detail, but it’s crucial. 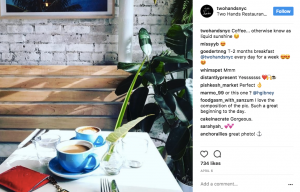 As social media plays an increasingly important role in dining decisions, restaurants that design with Instagram in mind are going to win. What are you your favorite Instagram-worthy restaurants? Let us know in the comments!